Volunteer firefighters douse a fire on County Road H in 2014. 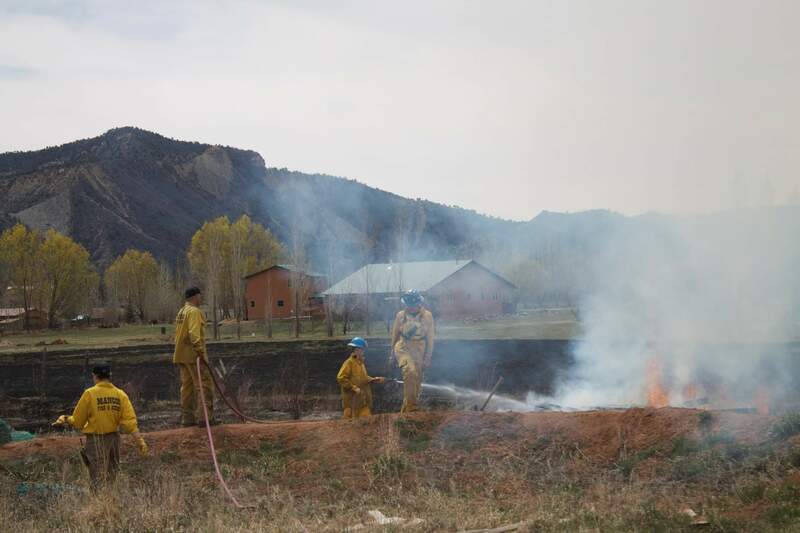 The region is under a red flag warning Thursday because of high fire danger, and a no-burn order was issued in Durango. Warm temperatures and continued windy conditions brought another red flag warning for Thursday. Also, the Durango Fire Protection District has issued a no-burn order for Thursday, meaning all burn permits are suspended. The red flag warning, from noon to 8 p.m., stretches the length of western of Colorado and includes Cortez, Mancos and areas just south of Durango. A red flag warning means that conditions are ripe for extreme fire behavior, including rapid growth if a fire starts. The forecast for the red flag areas calls for temperatures in the middle to high 80s with low humidity and winds of 10 to 20 mph and gusts up to 30 mph. Earlier this week, the winds were expected to lessen by Thursday. In Durango, the high for Thursday is expected to be about 80 degrees – with a hot weekend to follow with high temperatures expected in the low 90s on Sunday and Monday, according to the National Weather Service. Skies are expected to be sunny for the next week or so, with no rain in the forecast.